Prior to the patient leaving the operating room or procedural area. For payment determination purposes, the measure will be applied to ambulatory surgery centers for the calendar year 2015 and for the Hospital Outpatient Quality Reporting Program as OP-25 for calendar year 2014. The measure has been proposed for the Hospital Inpatient Quality Reporting Program for fiscal year 2016 and beyond (the final rule is anticipated to be issued in early August). Questions have arisen about how The Joint Commission’s Universal Protocol (UP) can be used to meet this structural measure. CMS does not require the use of a specific checklist, and provides examples of checklists that can be used. The World Health Organization (WHO) and The Joint Commission are specifically cited as resources. The UP focuses on wrong person, wrong procedure, and wrong site surgery, and includes issues that are addressed in many safe surgery checklists. Since the UP was published, checklists have been developed that contain additional practices supporting safe surgery, such as assessment of the patient’s risk of blood loss in terms of the units of blood available. 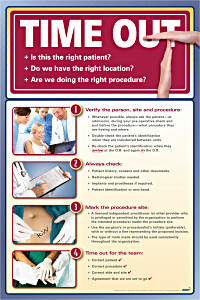 Our Surgical Safety Checklists highlight the important steps that must be taken to prevent wrong side, wrong site, wrong patient and wrong procedures in your OR. 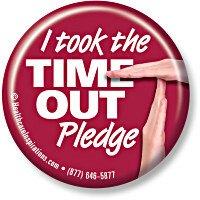 Promote Time Out with I.D. Peek-a-Boos. © 2019 Healthcare Inspirations. All rights reserved. 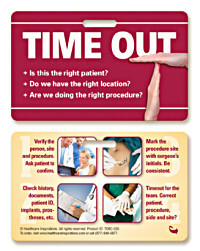 Pocket-Guide Series, Pocket-Guide to Pain Assessment, HealthTex, Badgie Cards. Peek-a-Boo, Comfort-Flex, and "I Wash Because I Care", "Clean Because I Care", "I Got My Flu Shot, Did You? ", "Get Smart About Flu! ", "Patient Safety 1st", "It's OK to Ask! ", "Patient Safety Starts with Me!/Us! ", "Clean Hands Can Stop MRSA", "Taking Caring to Heart", are trademarks of Healthcare Inspirations. Company and product names used throughout this site are trademarks of their respective companies. Although every effort has been made to make this website accurate - we cannot be responsible for errors in price or content. Products and prices are subject to change at anytime and are subject to prior sale. Healthcare inspirations is not affiliated with the Joint Commission®, which owns the Joint Commission trademark.